We provide a large selection of Albums and we also offer parent albums with any of our packages that you choose. 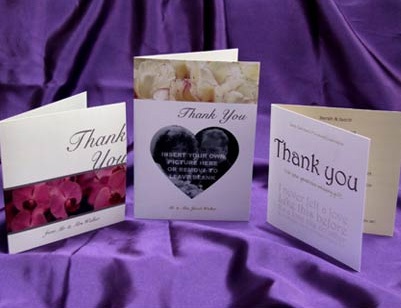 Thank You cards Remember to send your Thank You cards, personalised with your own wedding photograph. You can also add your own special thank you message. blank spaceReprints Reprints from 6×4 to 20×24 are available either on line via our online ordering system or if you prefer you can contact me direct with your requirements. Any of our reprints can be mounted in a wide selection of frames or alternatively you may wish to consider our Photoblock and Canvas Wraps a new and exciting way of displaying your images.